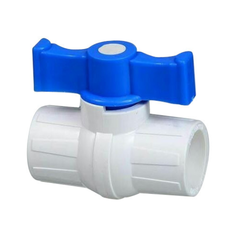 Leading Manufacturer of upvc ball valves from Coimbatore. Leveraging on our team of expert engineers, we have gained expertise in the manufacture of UPVC Ball Valves. The entire range of product is developed from the quality assured material and ultra-modern techniques as per the norms of industry. Offered product is checked on numerous parameters of quality in order to supply a faultless range. This product is made obtainable in various specifications to suit variegated demands of clientele.